This topic provides a brief overview of many of the features and tools included in Visual Studio for application development. 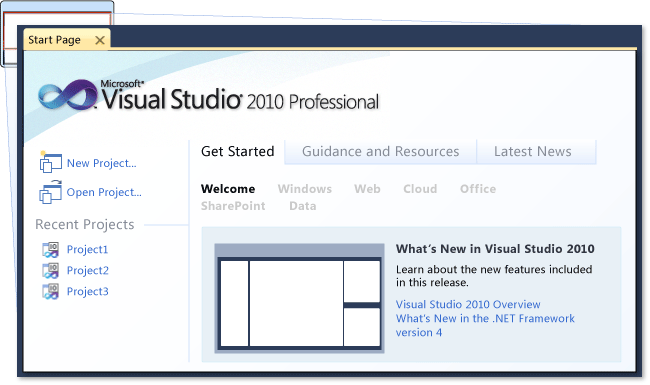 The Visual Studio product family shares a single integrated development environment (IDE) that is composed of several elements: the Menu bar, Standard toolbar, various tool windows docked or auto-hidden on the left, bottom, and right sides, as well as the editor space. The tool windows, menus, and toolbars available depend on the type of project or file you are working in. Depending on the settings you have applied, and any subsequent customizations you have made, the placement of tool windows and other elements in the IDE differs. You can change settings by using the Import and Export Settings Wizard. By selecting the Reset all settings option, you can change your default programming language. You can easily move and dock windows using the visual guide diamond or temporarily hide windows using Auto-Hide. For more information, see How to: Arrange and Dock Windows. You can use the Visual Studio automation model to automate and extend the IDE. For more information, see Customizing, Automating, and Extending the Development Environment. Solutions and projects contain items that represent the references, data connections, folders, and files that you need to create your application. A solution container can contain multiple projects and a project container typically contains multiple items. For more information, see Solutions as Containers and Projects as Containers. The Solution Explorer displays solutions, their projects, and the items in those projects. From Solution Explorer, you can open files for editing, add new files to a project, and view solution, project, and item properties. 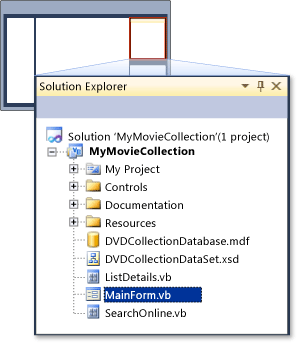 For more information, see Using Solution Explorer and How to: Create Solutions and Projects. The editor and designers you use depend on the type of file or document that you are authoring. The Text editor is the basic word processor of the IDE, while the Code editor is the basic source code editor. 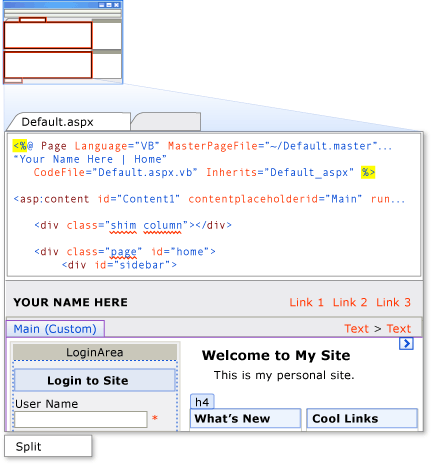 Other editors, such as the CSS editor, the HTML Designer, and the Web Page Designer, share many of the features found in the Code editor, along with enhancements specific to the type of code or markup supported. Editors and designers usually have two views: a graphical design view and the code behind view or source view. 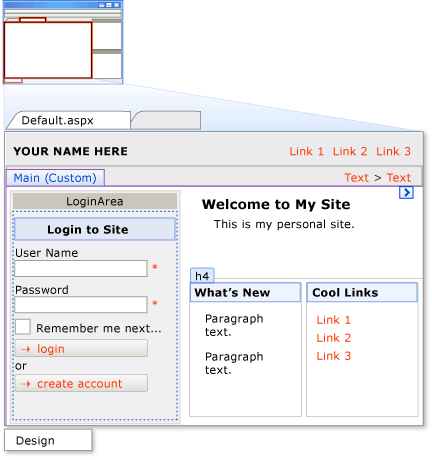 Design view lets you specify the location of controls and other items on the user interface or Web page. You can drag controls from the Toolbox and place them on the design surface. Source view displays the source code for the file or document. 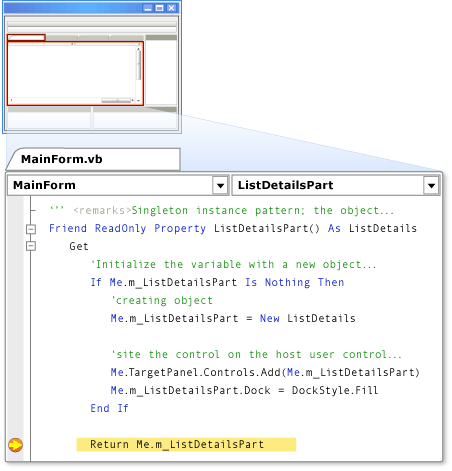 This view supports coding help such as IntelliSense, collapsible code sections, Refactoring (C#), and code snippet insertion. Other features include word wrap, bookmarks, and displaying line numbers, to name a few. For more information, see Editor Convenience Commands and Features. 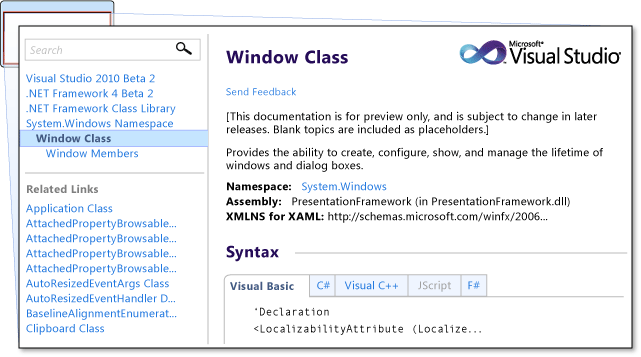 Some editors, such as the Web Page Designer and XAML Designer, also provide a hybrid view which lets you see the graphical and code view of a file simultaneously. This view is called Split view. Visual Studio provides a robust set of build and debugging tools. With build configurations, you can select the components that you will build, exclude those you will not build, and determine how the projects selected will be built and on what platform. You can have build configurations for solutions as well as projects. For more information, see How to: Create and Edit Configurations and Builds During Application Development. When you build, you are beginning the debug process. 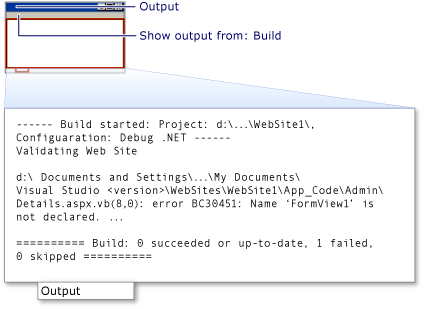 Building your application helps you detect compile-time errors. These errors can include incorrect syntax, misspelled keywords, and type mismatches. The Output Window displays these types of errors. After you have built your application, you can use the debugger to detect and correct such problems as logic errors and semantic errors that are detected at run-time. In break mode, you can examine local variables and other relevant data using tools such as Variable Windows and the Memory Windows. The Error List Window displays errors, warnings, and other messages related to debugging. For more information, see Debugger Roadmap. Visual Studio provides two different deployment strategies: ClickOnce and Windows Installer. With ClickOnce deployment, you publish the application to a centralized location and the user installs or runs the application from that location. With Windows Installer deployment, you package the application in a setup.exe file and distribute that file to users; they run the setup.exe file to install the application. For a detailed comparison, see Choosing a Deployment Strategy. ClickOnce allows you to quickly deploy applications using the Publish Wizard. For more information, see How to: Publish a ClickOnce Application using the Publish Wizard. Windows Installer deployment provides greater flexibility for deploying applications. Various editors, such as the Custom Actions Editor and the User Interface Editor, let you customize the Windows Installer to meet your deployment needs. To create a basic setup file, you use the File System Editor to specify which items are deployed. For more information, see Deploying Applications and Deployment Editors. You can access Help by pressing F1 in the IDE, as well as by clicking Visual Studio Documentation on the Help menu. The Help documentation appears in your web browser. You can use locally installed Help or use MSDN online and other online sources for Help.